Increase you hearing potential with today’s trending technology in hearing aid industry. Visit our hearing aid centre in Purasawalkam and gain more by spending less. Our Clinical ambience is designed to educate our customers with information on hearing loss, hearing aids and audiology. 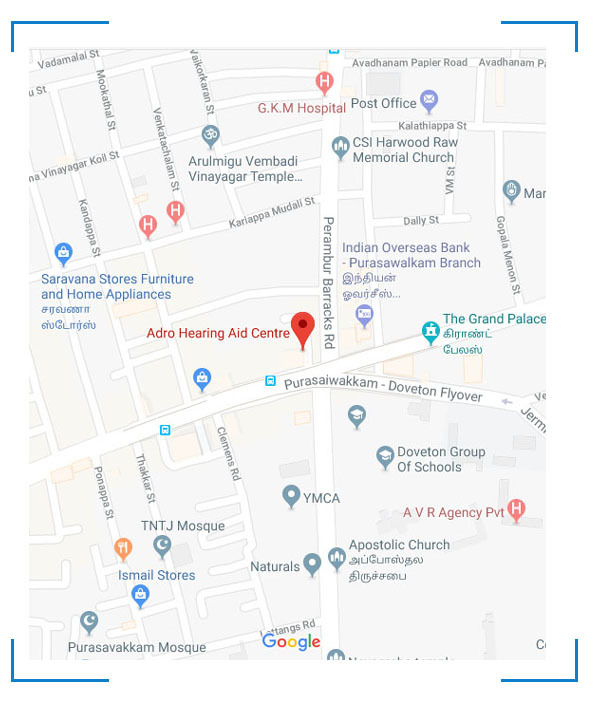 Meet our experts and you will understand the essence that why thousands of patients choose to resolve their hearing issues with our hearing aid store in Purasawalkam. Hearing aid has huge impact on human life and hearing health. Our professional skill in accurate digital hearing aid programming ensures that users invent their own love towards hearing instruments. We can make your hearing aids invisible with custom made hearing instruments. Mark our words; down the line we make users forget that he/she is actually wearing a hearing aid. Our house visit service can be availed by residents of Chennai in and around localities of Kilpauk, Purasawalkam, Washermanpet, Tondiarpet, Perambur, Villivakkam, Vepery, Egmore and Anna Nagar. A genuine hearing aid centre in Purasawalkam.